李小平, 万晓媛, 张庆利, 黄倢, 董宣, 王秀华, 邱亮, 宋增磊, 程东远. 2016~2017年中国沿海省市虾类偷死野田村病毒(CMNV)分子流行病学调查[J]. 渔业科学进展, 2019, 40(2): 65-73. DOI: 10.19663/j.issn2095-9869.20180420003. LI Xiaoping, WAN Xiaoyuan, ZHANG Qingli, HUANG Jie, DONG Xuan, WANG Xiuhua, QIU Liang, SONG Zenglei, CHENG Dongyuan. Molecular Epidemiological Survey of Covert Mortality Nodavirus (CMNV) in Cultured Crustaceans in China in 2016~2017[J]. Progress in Fishery Sciences, 2019, 40(2): 65-73. DOI: 10.19663/j.issn2095-9869.20180420003. Corresponding author: ZHANG Qingli, E-mail:zhangql@ysfri.ac.cn. Abstract: Covert mortality nodavirus (CMNV), a recently emerged RNA virus, is the pathogen responsible for viral covert mortality disease, which has caused serious losses of shrimp aquaculture in China in recent years. 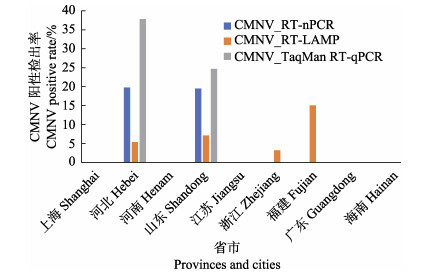 In order to determine the transmission, prevalence, and evolution of CMNV in the coastal provinces and cities in China, national wide survey of the molecular epidemiology of the CMNV and it's variants was conducted, based on analysis of shrimp samples collected from 2016 and 2017 by using the methods of RT-nPCR, RT-LAMP, and TaqMan RT-qPCR in present study. 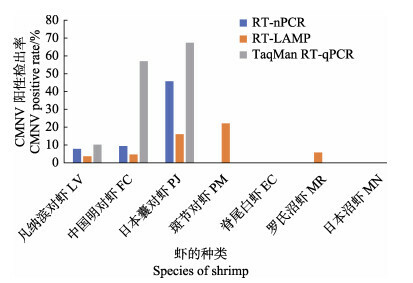 The analyses found the presence of CMNV-positive specimens in the major species of cultured crustaceans, including Litopenaeus vannamei, Marsupenaeus japonicus, Fenneropenaeus chinensis, Penaeus monodon, and Macrobrachium rosenbergii. CMNV-positive specimens appeared in almost all the coastal provinces, such as Hebei, Shandong, Zhejiang, Fujian, Guangdong, and Hainan. The results based on RT-nPCR assays showed that the prevalence rates of CMNV among the collected samples were 11.8% (30/254) and 7.8% (30/387) in 2016 and 2017, respectively. The results based on RT-LAMP assays showed that the prevalence rates of CMNV were 6.7% (17/254) and 3.9% (15/387) in 2016 and 2017, respectively. The results based on TaqMan RT-qPCR assays showed that the prevalence rates of CMNV were 17.7% (45/254) and 12.4% (48/387) in 2016 and 2017, respectively. The total prevalence rates of CMNV were 26.8% (68/254) and 16.3% (63/387) in 2016 and 2017, respectively, based on the above mentioned three methods. The results based on RT-LAMP assays showed that the prevalence rate of MDNV was 9.4% (24/254) in 2016. 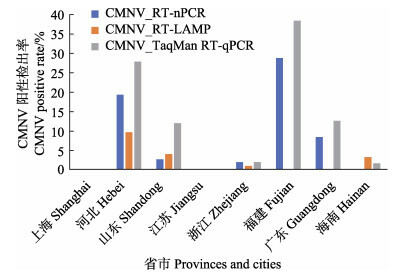 The high prevalence of CMNV in the major shrimp species and in the main farming areas revealed that this virus still threatened shrimp aquaculture in China during 2016~2017. 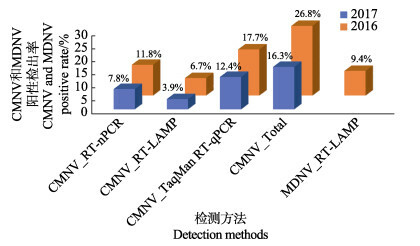 Moreover, mutation of the RNA-dependent RNA polymerase (RdRp) gene of CMNV will raise the risk of appearing of false-negative result in CMNV molecular tests, which is of great concern. Meanwhile, the high prevalence rates of the emerging CMNV variant, MDNV, is a reminder that close attention needs to be paid to the high risk of MDNV transmission widely in farmed crustaceans.